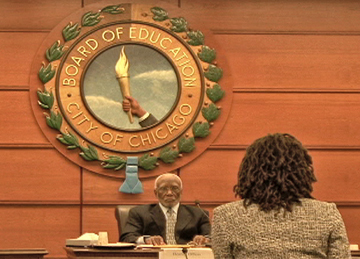 During January and February of 2012 the Chicago Public Schools, pressured by recent state law to do so, held open hearings on the question of whether to close or turn-around targeted schools in minority and low-income areas of the city. But, as George Schmidt (Substancenews.net) points out, "the hearings are basically show trials...in a way [they] are a cruel joke played upon the people from the community." Adding to the fact that CPS has already secretly made their decisions before the 'hearings', another underhanded scheme has been exposed. Paid 'protesters' were bussed in to support the school board's view that the schools should be closed or turned around. The rent-a-protester ploy was originally unearthed by Substancenews.net in September of 2011, and then in January, 2012 it was picked up by Chicago's corporate media, as the scandal could no longer be ignored. Produced by Labor Beat. Labor Beat is a CAN TV Community Partner. Labor Beat is a non-profit 501(c)(3) member of IBEW 1220. Views are those of the producer Labor Beat. For info: mail@laborbeat.org, www.laborbeat.org. 312-226-3330. For other Labor Beat videos, visit YouTube and search "Labor Beat". On Chicago CAN TV Channel 19, Thursdays 9:30 pm; Fridays 4:30 pm. Labor Beat has regular cable slots in Chicago, Evanston, Rockford, Urbana, IL; Philadelphia, PA; Princeton, NJ; and Rochester, NY. For more detailed information, send us a request at mail@laborbeat.org. We depend on your support. Help us continue producing labor's story for cable tv and Internet.